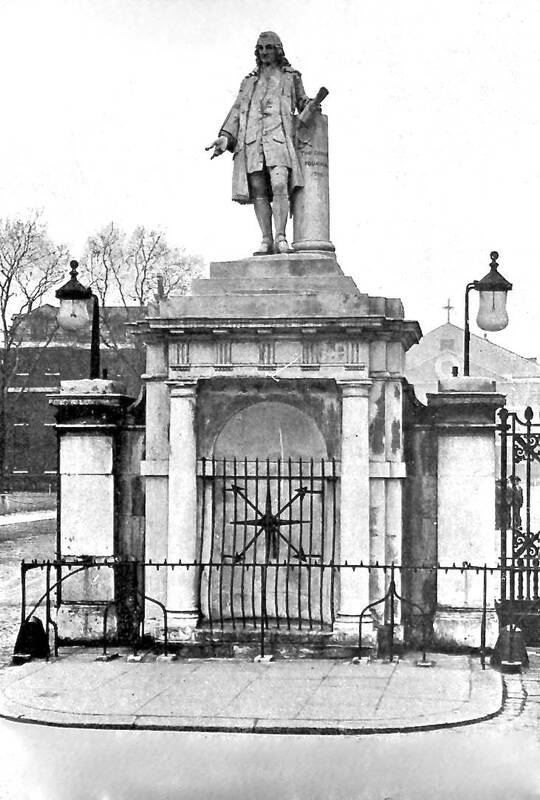 "An excellent statue of Coram, by Calder Marshall, was set up at the gates of the Hospital in 1856; but the stone out of which it is cut has already proved so friable, that it has had to be painted over to save it from destruction" (29 March entry in Chambers', 1869). When the Hospital was demolished in 1926, "only the southern colonnaded range and the pedestal for Thomas Coram's statue survived" (listing text). "Ashlyn's School Building, including the Chapel, Main Block and Classroom Wings, Berkhamsted." British Listed Buildings. Web. 2 June 2013. (Ashlyn's Scool, Berkhamsted, was originally built for the Foundling Hospital when it moved from London, and the text here gives some useful historical background). Chambers' Book of Days (1869). Emmitsburg.net. Web. 30 May 2013.